Business Process Management (BPM) is the medium that transforms ideas into intellectual property. Business Process Management is the management of well-defined processes from beginning to end. Corporate strategy changes over time but always requires the alignment of people and processes in order to realize the mission of the organization. In the past, the Information Technology (IT) department delivered the systems. What is now required is for IT to move beyond a systems focus and coordinate with the people in your organization in what we call Business Process Management (BPM). IT is the medium that transforms ideas into intellectual property. Does Management Use Business Process Management? From the name of it, BPM sounds like a management discipline. Yet, when we sit down to document business processes within an organization who is involved? Typically it is not management or at least not anyone from upper management. Management takes the approach that the process is static. 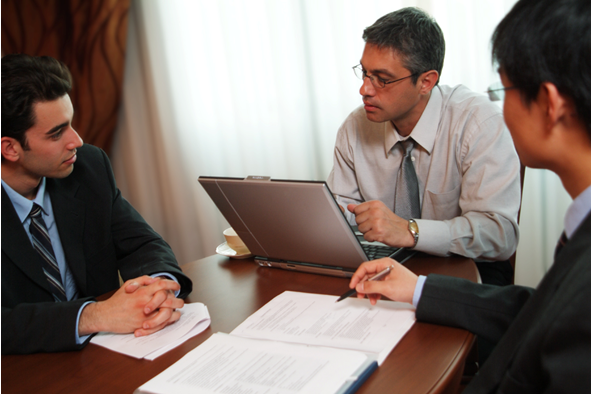 Therefore, just have the employees in the process document what they do into procedures. Yes these are the process procedures, but without management’s involvement what has really been written are work instructions and not procedures. Management is responsible for company strategy. Policies are then created to support that strategy. So management is responsible for translating policy into actions (i.e. policy deployment). Your procedures should describe a business process in enough detail so that every employee can manage their own process effectively. Effectiveness is a function of how well they achieve the strategy. So in order for employees to deliver on management’s strategy, they need to know what the strategy is in terms of their own process results. It is not enough for an employee to count transactions or hours worked, your employees must account for what was produced or accomplished and then compare those process results to the expected process results that management’s strategy planned. This means, the strategy deployment process must translate management strategy into policies that the workers can use to develop process procedures and process actions (work instructions). Management is responsible for half of the process – strategy and policy. Management is also responsible for reviewing process results against strategic objectives and taking action on unplanned results. Just having a process defined is great but, your process is intended to produce a result too. Your shipping process is intended to distribute your products to your customers. Someone needs to monitor the process to make sure that your products are getting to your customers. Usually this is the process owner or somebody in management. Process monitoring ensures the process produces outputs, but it may not ensure that the process produces good output or achieves the planned results. Process monitoring is part of the (D) Doing step in PDCA. To achieve planned results you must measure the process and take actions to move wayward processes into producing good outputs. What does “producing good outputs” mean? It means you must measure the right stuff. Monitoring your processes is important but if you don’t measure the right things then you may not get the right results either. Measuring requires that you have a target or goal defined. Common goals include On Time Delivery, % order complete and accurate order fill rates. Measuring is all about comparing your collected data to the target. Process measures are part of the (C) Check step in PDCA. Are your processes effective? Process control is all about taking action to ensure your process is effective and achieving planned results. This means you have to have a defined process in place that establishes that the process is monitored, your process is measured against a target, and you have the ability to take action to correct your process from producing bad results. Process control is the goal of any process measurement activity. It is the focus of the process approach of the ISO 9001:2008 quality standard. Process control is part of the (A) Act step in PDCA. If you are intent on real business process management, then business process control is what it is all about. Processes are broken into descriptions of activities and tasks that define a business workflow under varying business conditions, such as the steps needed to execute your accounts payables operation. Documenting the workflow for a group of individuals is done using document maps or process maps. However, the IT department needs a lot more than a process map, they need to construct an information map or what some might call a Data Flow Diagram (DFD). The information map contains the flow of data from one process, activity, or task to another. As opposed to product-flow, information flows (i.e. documents, records or other data) must be described in detail in order for IT to implement the process. Data Flow Diagrams are used to illustrate the sources and uses of data, the data stores (databases), and, of course, the data flows. Information maps are used to describe your Information Deployment strategy. As you might have guessed, your information maps can get real complicated, real fast. So how do you reduce the complexity? Use software of course. New BPM Software tools have been developed that allow organizations to graphically define their processes, the actual information flows, and add detailed business rules those processes use to process the information. Once all of this information is defined, the software can even execute a simulation using your definitions and show you the results. But that’s not all, the software will also convert your design into a computer language that you can run. Next, add your process metrics (effectiveness criteria or key performance indicators) along with hooks into your existing applications and the software will monitor the results. Some BPM software applications even interface with metrics databases that allow you to benchmark your performance to the industry. BPMS is being used at all the major corporations today. To move your IT department into the 21 st century you are going to need to be using some type of BPMS tool. When you first ask your employees to document business processes you end up with policies and procedures, work instructions, and forms describing the work that employees perform. It tends to be very transaction oriented and focused on the work. When you ask your employees to look at your business as a series of processes, then you end up with process maps, process interaction diagrams, and subject matter experts involved. The process documentation is better, focused on the process, but it is still missing how each process interacts with the other in a system of processes and delivering the strategic results. But if you really want your employees to manage their business processes, then you will need Key Performance Indicators (KPI), measures for strategy attainment, and a workforce team with upper management involved as a member of that team ensuring that business processes are managed for results. Isn’t that what business process management is all about — management managing and delivering results? Many business processes are poorly defined, but this can be fixed. Start by creating process maps for all of your core business process. 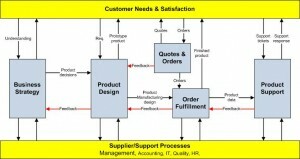 Creating process maps is the first step to improving your business process management. Most business do not do a very good job of monitoring their processes. Do you know what all the defects are that can and do occur with your core business processes? Using your process maps to identify critical data to monitor is the next step in your business process improvement journey. If most businesses do not have process maps and do not monitor their processes, then how did they determine the measures for their business? And if the measures do not come from your process maps and your monitoring, then what kind of a measure is it? Predominately lagging measure of success like revenue, profit, or inventory turns. What you need are some leading indicators of success like new customer formation, repeat business (which leads to lifetime customer value), or sales cycle closing time. Your PDCA cycle culminates in taking appropriate action, but what’s appropriate is relative to the measure of success you are following. Follow the wrong measures and your perspective of appropriate actions changes. Finding measures to your business is a lot easier once you have followed a PDCA path of define processes, monitoring processes, and then measuring your processes. Recently I had started hearing people talk about business process management and I had no clue what they were talking about, and I got curious about what it was. Now I know that its basically the management of a well defined process. I found the topic interesting and understood why people started talking about it. I hope people find out more about this topic and understand it like me.